There is little doubt that that phrase could have been the headline for the back page of the Philly Daily News for Tuesday’s edition… even before the game was played. But now, that phrase played out in a whole new way, and neither Alerbt Pujols nor Ryan Howard had anything to do with it. 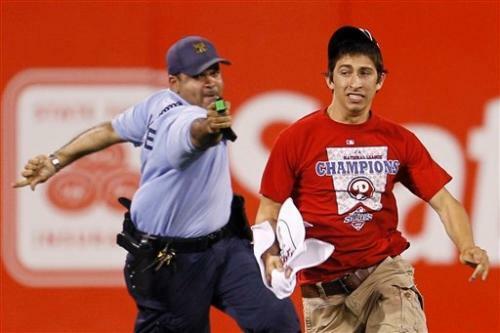 Just before the start of the seventh inning a 17-year old fan made his way out on to the field and ended up face down in the grass in left field after being tasered by a Philadelphia Police officer. I know that in this day and age, you can never take anything or anyone for granted. But this was the first time that I had ever seen a fan tagged by electric shock for running on to the field. Give Joe Blanton a lot of credit for an impressive performance in his return from the Disabled List. He looked very good for the first six innings, but ran into trouble in the 7th Inning. Now contrary to the reports given by a noted football writer posing as a baseball expert on the radio, Blanton had every right to go back out for the start of the inning, sitting on 93 pitches. The real question is why Phillies Manager Charlie Manuel (or whoever had the lineup card after Manuel was ejected earlier) didn’t use Jose Contreras in the 7th Inning to try to get out of trouble, especially needing a double play with Contreras’ splitter. Instead, Nelson Figueroa entered and allowed a three-run double to David Freese which turned it into a comfortable Cards lead. Give Manuel credit for standing up for Blanton in the 5th Inning after the pitcher was called out for interference. Apparently, Home Plate Umpire Andy Fletcher said Blanton pulled an A-Rod (swatting his arms at another player) while running out a bunt. Replays CLEARLY showed Blanton raising his arms only when 2B Skip Schumaker made a lunging effort across the pitcher’s bow to prevent a wild throw. What would have been a crucial run to give the Phillies the lead ended up as just another key spot in which the Phillies didn’t produce. Phils reliever Brad Lidge worked a relatively quiet 9th Inning, allowing just a two-out double to Matt Holliday. He struck out two batters and enduced Albert Pujols to fly out to right field on the evening.